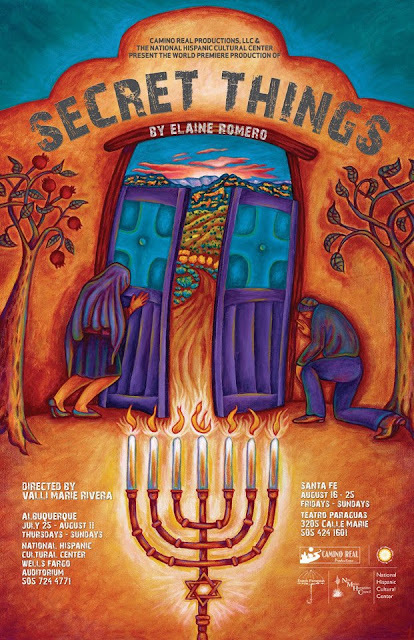 Elaine Romero, Playwright: Camino Real Productions, LLC and Albuquerque's National Hispanic Cultural Center are honored to present the world premiere of Secret Things, by award-winning playwright Elaine Romero. Tickets: $18 Community. $13 Students / Seniors / NHCC Members. Secret Things tells the story of Delia, a Time Magazine writer in the 1990s sent on assignment to her native New Mexico to do a story that will quash the rumors her skeptical editor has been hearing from someone in New Mexico about Crypto-Jews. While researching the story in Albuquerque and Santa Fe, Delia starts having strange thoughts and dreams and finds herself transported to a mythical land called Sephardia, through which she comes to experience and learn about her own family’s secret past. 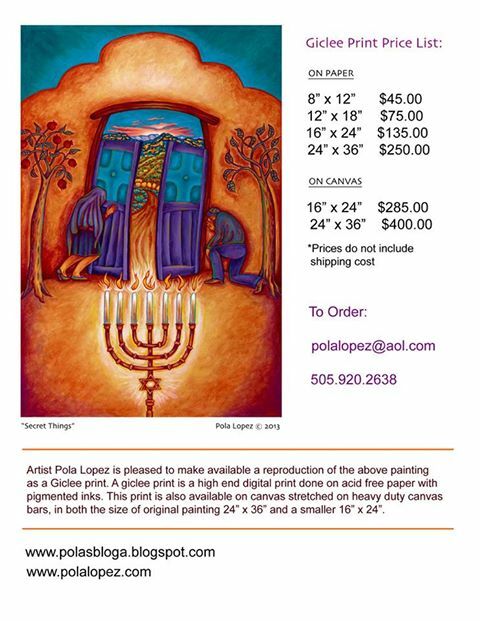 Camino Real Productions’ 2012 production, Paloma, was inspired by la convivencia – a period in Spanish history when Muslims, Christians and Jews lived in relative harmony in medieval Spain. Secret Things shows what happened after that - when, in 1492, Jews and Moors were expelled from Spain. Many relocated to the New World to escape the Inquisition and some of their descendants ended up in New Mexico. Playwright Romero is not from New Mexico, but her grandmother was born in Barelas, just blocks from where the National Hispanic Cultural Center is now. 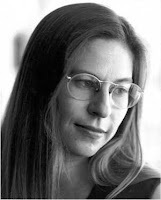 In the 1990s, while doing research on another play in the Archives in Santa Fe, she encountered State Historian Stanley Hordes, the leading expert on the subject of crypto-Jews in New Mexico. That encounter led, eventually, to the realization that her New Mexican ancestors had been crypto-Jews. Secret Things is the result of that chance encounter. Secret Things is directed by Valli Marie Rivera, whose earlier New Mexico-related productions have included Rudolfo Anaya’s plays Bless Me, Ultima and, more recently, Rosa Linda. She directed Elaine Romero’s ¡Curanderas! Serpents of the Clouds at the Santa Fe Playhouse in 2006. The cast of well-known New Mexico actors includes Mario Moreno, Lila Hadda Martinez, Salome Martinez-Lutz, Harry Zimmerman, and Benjamin Lieberman. Set and lighting design are by Josh Bien, and the costumer is Jaime Pardo. Casey Mraz is composing an original musical score for the production. Want to learn more? You can read David Steinberg's Sunday Albuquerque Journal article here. Gabby Friedman's 2005 article in the Jewish Journal is here. And you can find information about the Teatro Paraguas production here.